She's Fantastic: Go-Go Rangers: PINK & YELLOW MEGARANGERS! Go-Go Rangers: PINK & YELLOW MEGARANGERS! Marvel's Superhero Squad may be practically kaput (except for the much-appreciated selection of movie figures put out every year), but luckily the general design aesthetic is being carried on by our fine friends at BanDai. Five years ago the toy aisles were cluttered with these little guys: Marvel SHS, Star Wars Galactic Heroes, G.I.Joe Combat Heroes, Indiana Jones Adventure Heroes, Transformers Robot Heroes.. it was insane (and I was really really into the fad). It's funny, because the first attempt at these cutesifued Power Rangers (2007's Go-Go Rangers) was not my favorite, mostly because they were a smidge too large to blend into all the Hasbro lines. 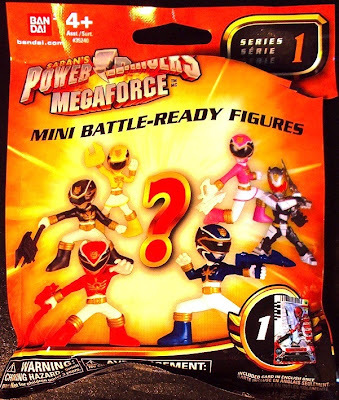 However, this third iteration (the MegaForce Mini Battle-Ready Figures) is finally scaled down to the perfect size. An interesting special addition to this new series are "secret" re-issues of that 2007 MMPR series. They're mixed in to the blind bag assortments. So, in summary, the females from Series 1 are Mega-Pink, Mega-Yellow, and MMPR-Pink. Let's check them all out below! They have a lot less articulation than their predecessors. Yellow has no articulation at all and Pink is only articulated at her gun wrist. All the figures come with scannable cards. Not quite sure what the function of them is.